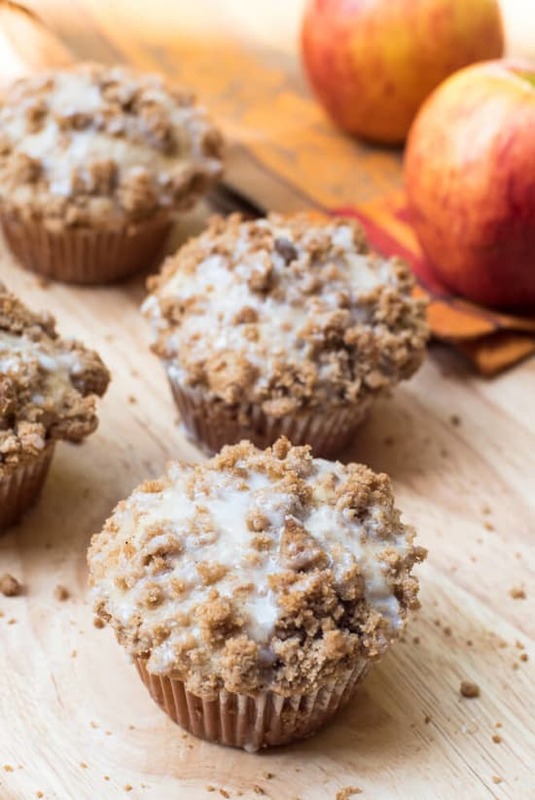 The flavors of fall make these Glazed Apple Coffee Cake Muffins the perfect treat for the coming season. If there’s anything that can make it less painful to say goodbye to the lazy days of summer, it’s these lovely muffins. The transition to fall can be tough, believe me, I know. But we’ll do it together, and we’ll do it with something sweet. Let’s look at the bright side. 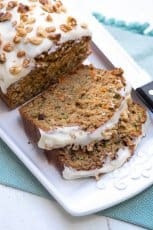 We may be saying goodbye to long sunny days, a more relaxed schedule, summer trips, and casual summer clothes (I love casual summer clothes), but we get to say hello to hearty, comforting food and all things apple and pumpkin. Yes, I can be bribed with food. 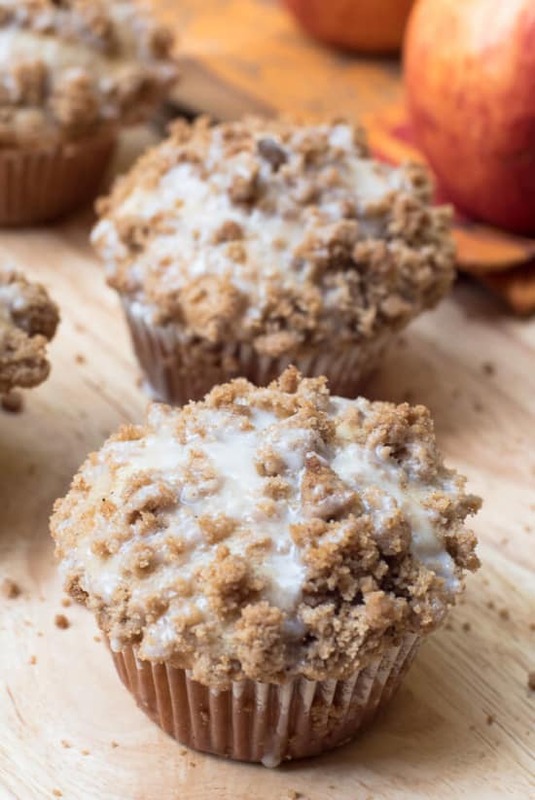 I’ve taken my base muffin recipe (see my other variations at the end of this post), added some apple, cinnamon and nutmeg, topped them with a tasty streusel, and finished them with a simple powdered sugar glaze. As they bake, your house will fill with an incredibly comforting aroma and quickly remind your entire household that there are some big benefits to the fall season. 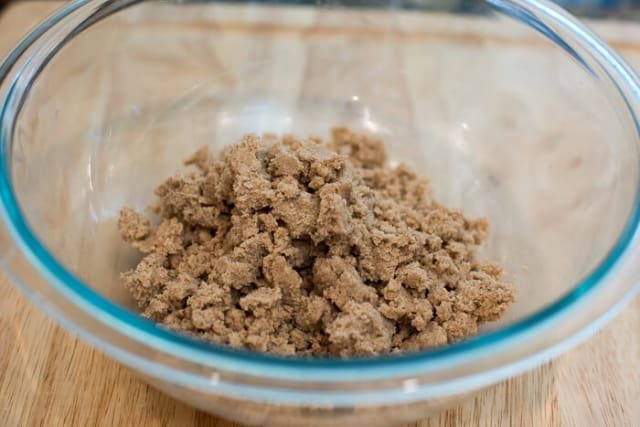 To prepare the streusel topping combine 3/4 cup all-purpose flour,1/2 cup light brown sugar, 1 teaspoon cinnamon, and 1/2 teaspoon salt. 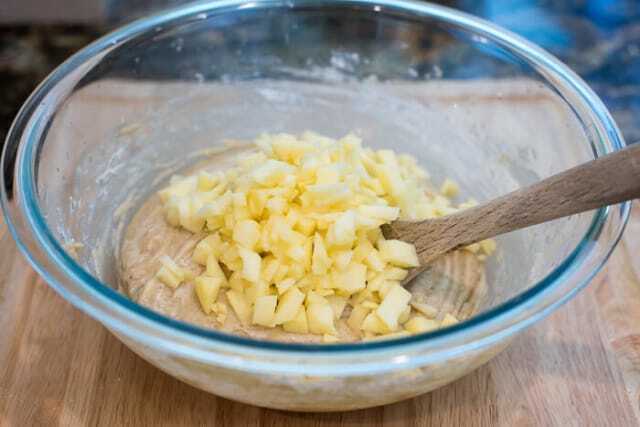 Use a pastry blender or fork to cut in 5 tablespoons of softened, unsalted butter. Once combined, press the mixture between your fingers until it begins to hold together. 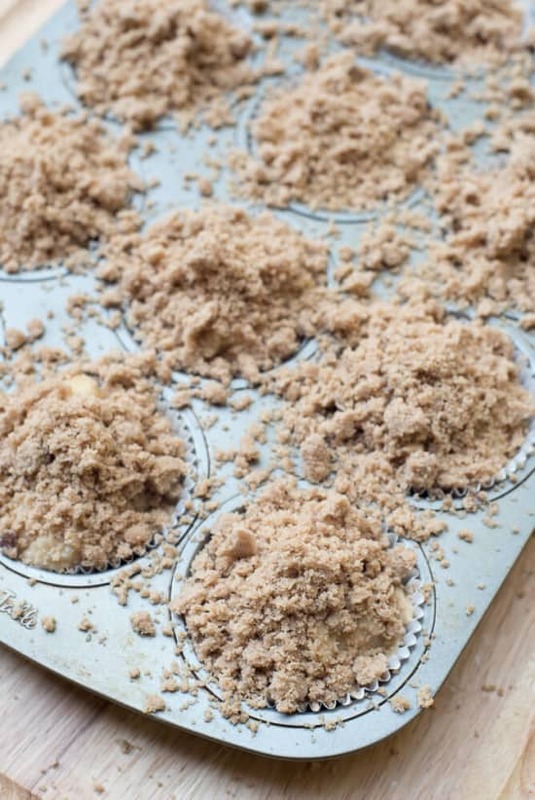 Set the streusel aside and let’s get the muffin batter going. 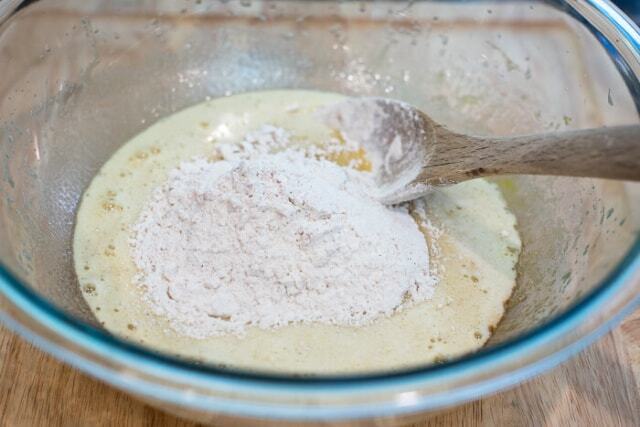 Combine 2 eggs, 1 cup sugar, 1/2 cup vegetable oil, and 1 teaspoon vanilla in a large mixing bowl. 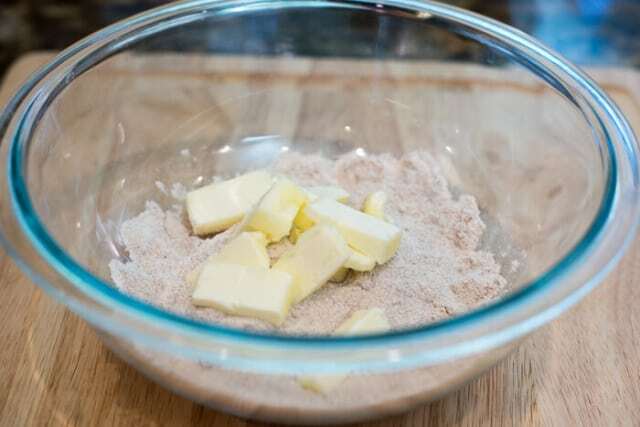 Combine the dry ingredients – flour, cinnamon, nutmeg, salt, and baking soda- in a separate bowl (see the recipe below for precise measurements). Add the dry ingredients to the wet ingredients, in increments, alternating with sour cream or non-fat plain Greek yogurt. Sour cream and non-fat plain Greek yogurt are interchangeable in this recipe. I use what I have on hand and this time around it is light sour cream. Continue adding the flour mixture and the sour cream or yogurt, and mix till nicely combined. The best baking apples are of the crisp, tart-sweet variety. I went with this pretty Envy apple but there are lots of varieties to choose from. Honeycrisp, Mutsu (my absolute favorite when I can find them), Fuji, and Gala are also great choices. Granny Smiths are probably the most widely known baking apple but they are very tart so I’ll only use them when the recipe calls for more than one so that I can mix in another variety to add more sweetness without adding tons of sugar. Peel, core, and chop your apple and fold in a heaping cup full with a spoon. 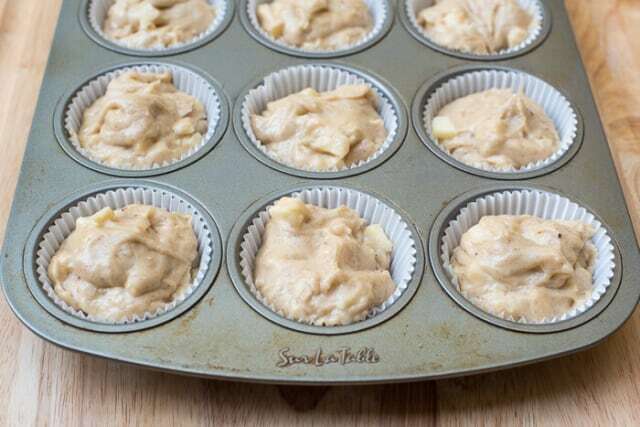 Line a 12-cup muffin pan with cupcake liners and divide the batter evenly between them. One of the many things I love about this recipe – it makes a perfect dozen. Divide the streusel between the 12 muffins, lightly pressing it down so it will stay in place as the muffins rise in the oven. It may look like a lot, but pile it all on. If you lose a little in the baking process, it’s fine and dandy because the glaze will fill in the empty spaces. I recommend brushing off any stray streusel from the spaces between the muffins as best you can before baking for easier cleanup. Pop the pan in a preheated 375 F degree oven for 22 to 25 minutes. You’ll know they are done when the streusel is golden brown and a toothpick inserted into the center of one of the muffins comes out clean. 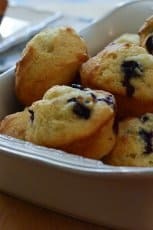 Allow the muffins to cool in the pan for about 10 minutes, then remove them and allow them to cool completely before drizzling with the powdered sugar glaze. 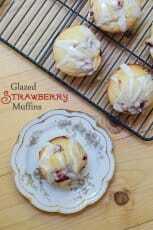 See the printable recipe below for the easy glaze directions. 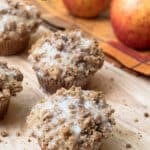 The flavors of fall make these Glazed Apple Coffee Cake Muffins muffins the perfect treat for the coming season. 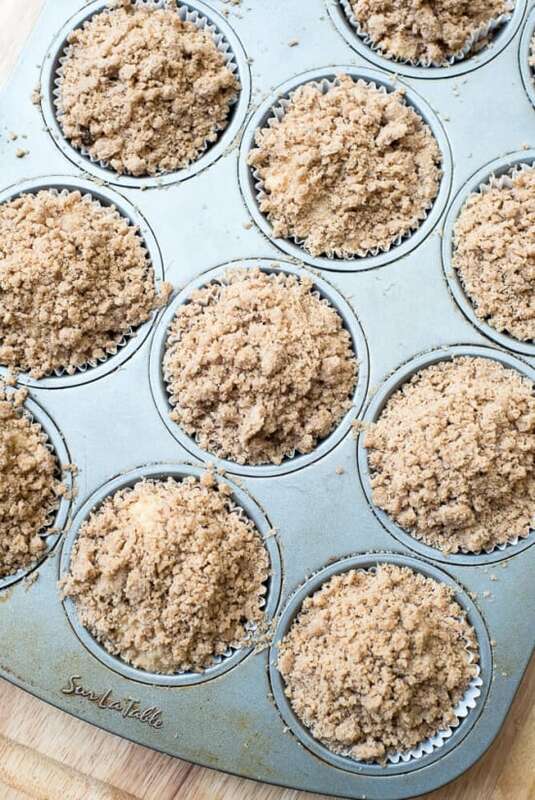 Combine all streusel ingredients in a small mixing bowl with a pastry blender or fork.. When it is well mixed, work the mixture between your fingers until it begins to hold together. Set aside. Preheat oven to 375 F degrees. Line a 12 cup muffin pan with cupcake liners. In large bowl beat eggs with an electric hand mixer. Add 1 cup white sugar and beat for a minute or two until completely combined. Pour in the oil, with beaters running, and then add vanilla. In a separate bowl, stir together flour, cinnamon, nutmeg, salt and baking soda. 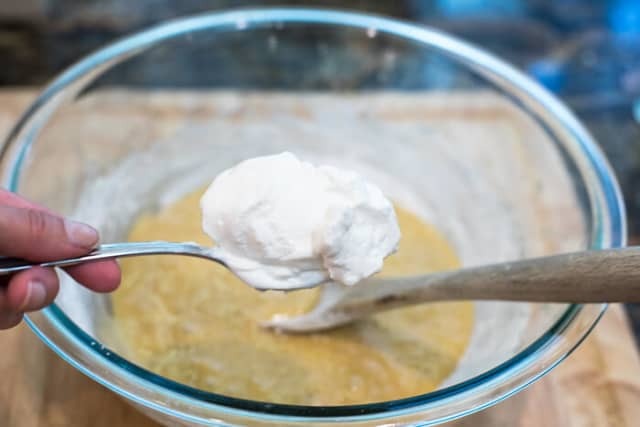 Using a wooden spoon, mix flour mixture into wet mixture, a little at a time, alternating with the sour cream (or Greek yogurt). Add the chopped apple and mix with the wooden spoon just until combined. Divide the batter between cupcake liners. 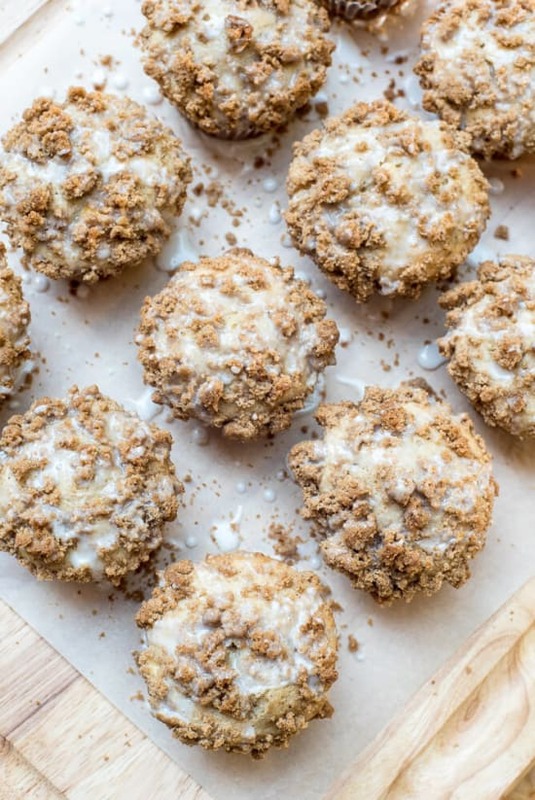 Divide streusel topping evenly over the muffin tops, pressing down lightly into the batter. Brush off as much of the streuself from the area between muffins for easier cleanup. Bake in preheated oven for 22 to 25 minutes, or until a toothpick inserted in center of muffin comes out clean. Remove from oven and allow muffins to cool for about 10 or 15 minutes and then carefully remove from muffin pan to cool completely. Whisk together glaze ingredients and drizzle over completely cooled mufins. I’m not ready for fall, but these muffins will help. 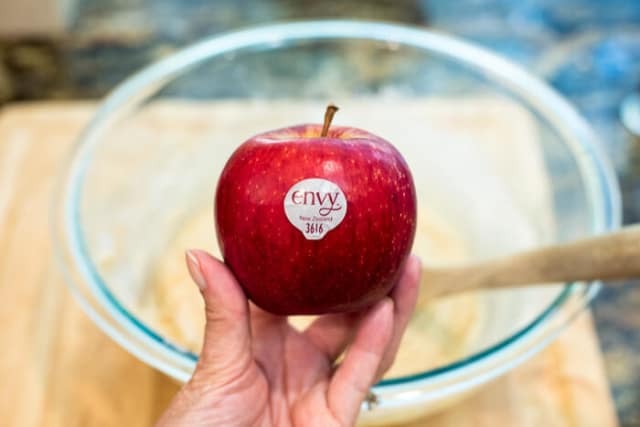 I have been loving the Envy apples! The perfect flavors! Love this for Fall! I absolutely love the fall baking season. I’m not ready for summer to be over, but it is nice when apples and pumpkin are in season. Coffee cake is one of my most favorite things. 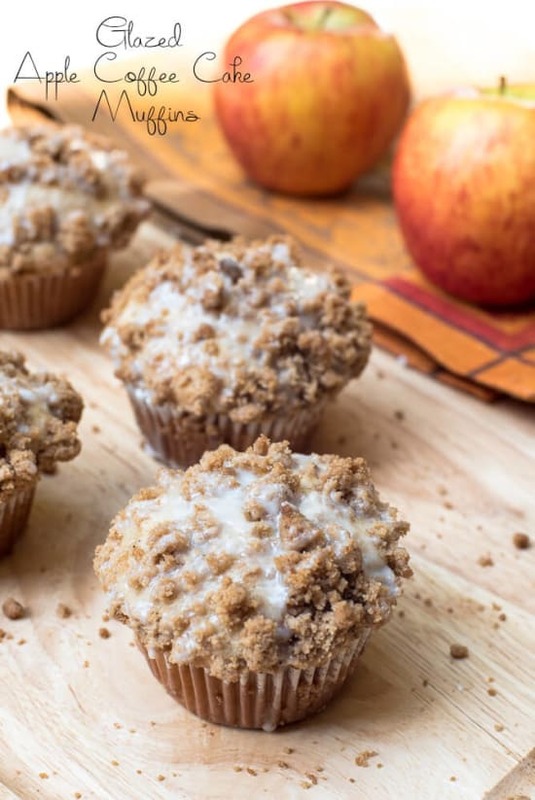 I love that you turned it into muffins – with apples! Bring on the fall! Every time I make streusel for muffins, it melts into the muffins! Teach me your ways! These look amazing! Oh I can definitely be bribed with food too! 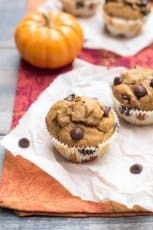 These muffins look amazing – you are so right, they are the perfect way to welcome fall! I love cinnamon, Apples, pumpkins,nutmeg . You’re right these are good foods and very yummy . These look PERFECT from top to bottom! I’m in love with the streusel & glaze!